One of the hardest parts of niching for most people is they don’t really know what a clear niche would even look like. Or worse, they think they do and then proceed into the marketplace with a bad one and get little to no response. I would say that 95% of the people who come to my workshops have no meaningful sense of a workable niche. 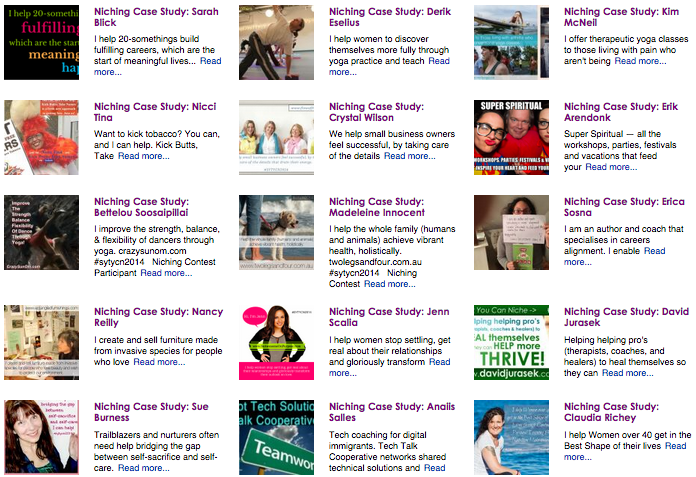 What follows are over 240 case studies for you to enjoy and learn from. 1) 1-10 Rating: Each case study was ranked 1-10 on how clear it was. Just click on any of the __/10 numbers below. 2) Tag Cloud: Just click on any words in the tag cloud that seem close to the kind of work that you do. For example, if you’re a life coach, you just click on the words Life Coaching and it will take you to a page with a number of case studies – each one of which you could click on and read and in depth analysis of. 3) Search bar: Wondering if there’s a case study about a very particular type of work you do? Just type it into the search bar and find out. Note: These niching case studies were all entries in Marketing for Hippies’ So You Think You Can Niche? Contest. The parameters of the contest were to provide one’s niche in 140 characters or less (that’s the length of a Tweet!) and present it in meme-format. Tad Hargrave offered his rating of 1-10 (1 being unclear and 10 being crystal clear) along with his feedback on each niche. Contest participants were also invited to give one another’s niches a rating and provide any constructive thoughts on how the niches could be clarified. Any judgements pertaining to the photos or images or the overall visual impact of the memes have been removed for the purposes of these case studies, which focus on the actual niche.